I have passed Carte Blanche many times but rarely during daylight hours, however, every time I feel compelled to press my face up to the glass and peer inside. When I do manage to stop in during store hours I am treated to friendly service and well designed, detail oriented garments. Despite the glossy leopard statue that sits atop the jewelry case in the middle of the store and the neon-eagle in the window, the space seems rather paired down. A black and white themed interior complimented by high ceilings, lined with classic crown molding and thick grey marble backings behind the clothing racks; every embellishment is well thought-out. The atmosphere created perfectly reflects the store's fashion philosophy. Owner Daniel Augustino explains that the store is a mix of high and low, which aims to give clientele free range to dress at one's own discretion A philosophy practiced and encouraged by the helpful staff. Like most stores on Queen West there is an in-house design studio where designer Tania Martins and her assistant and store manager Ailin Marin produce the in-house brand Pink Cobra. I admired a black and white checked silk chiffon blouse from the label, a pair of dark grey April 77 jeans, as well as the distinctive French and Italian vintage heels and handbags on offer. The vintage accessories compliment the carefully chosen brands, such as Jeremy Scott, Cheap Monday, JG4B, a store exclusive, and Linda Farrow Gallery. Carte Blanche is always on the look out for well designed, fun, original pieces and is consistently adding new, mostly European labels to their collection. 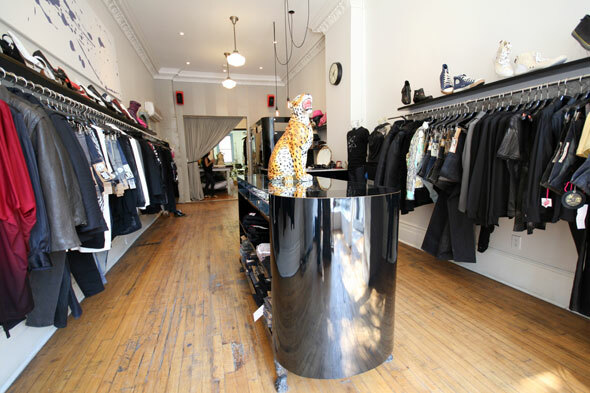 It is a very chic retail space with a firm sense of irony and wit offering equally descriptive clothes and accessories.